Susan Riya, Director of the New York State Water Resources Institute, shared the following map with the State of Upstate conference attendees in June. I have been thinking of this map ever since. 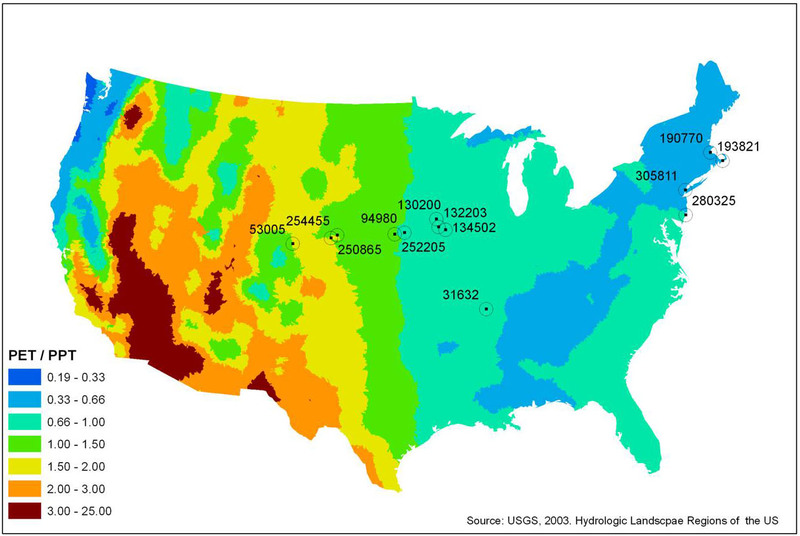 The map was derived from the hydrologic landscape regions of the United States dataset published by the U.S. Geological Survey in 2003. It depicts the ratio of potential evapotranspiration (PET) to precipitation (PPT). Hydrologic Landscape Regions of the U.S.
What is striking to me is the blue swath that runs from the tip of Maine to Louisiana as well as the lighter blue area along the Eastern Seaboard. I have called many communities in these two regions home; I know the landscape well. The map depicts current conditions, and I am eager to see similar maps that depict projected change. I know that New York State is expected to remain water-rich, and I suspect that much of the darker blue region will as well. But the area along the seaboard, especially the Southeast (portions of Georgia, the Carolinas, and Virginia), has already been experiencing droughts, and I fear that the region might be much drier in the future. Personally, I think it would be heartbreaking to see the steamy lushness replaced by crunchy dryness! The other effect is that the cool, water-rich places will be very attractive to people escaping the heat and dry conditions. New York State – get ready for a resurgence in population!